Chinese Nationals — is Chen Chuyan the one to watch? The Chinese national championships just ended, providing us with at least a glimpse into the depths of the Chinese gymnastics program. Five of the Olympians placed in at least one event, although a number of them did not compete AA but rather focused on specific events. For me, this is the best news because it means Cheng Fei is sticking around, at least for now. If she stayed the whole quad, she could (I think) be the first Chinese woman to attend three Olympic Games. But I think it’s also possible she’s sticking around for a shorter amount of time, perhaps even just until the World Cup Final, at which she has a good shot at winning in two events (VT, where she currently ranks second and FX, where she ranks third). Cheng is the only one of the Chinese team to have a mature gymnastics style (no comment about what that says about age, particularly since Cheng has always had a more mature style …) and even though I like many of the other girls very much, she provides some good balance. 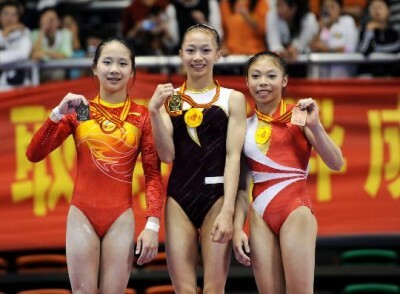 As for other gymnasts, the medal distribution should remind us that China had some pretty strong back-ups for the Olympics. Second in the AA was He Ning, who also took second on both UB and FX. She has been in the spotlight since 2006 when she took first in Doha and was a member of China’s first team to win gold at Worlds, and was an alternate for Beijing. Xiao Sha, the first Olympic alternate, has made somewhat of a comeback, taking first (in a three-way tie) on BB, as I mentioned. Not sure if she competed other events; she was apparently sick. The third alternate from Beijing, Sui Lu, who took first on BB and FX back in the May national championships, was absent as far as I know. The major deal is Chen Chuyan, who beat the better-known Cui Jie for the junior AA title earlier this year, and placed *third* in the AA at this event, though she did not medal in any EFs. This girl is clearly improving exponentially right now. Something to watch. I find her gymnastics a little boring, but certainly strong. Cui, incidentally, was around, but didn’t break into the top three on any event. She did qualify to FX finals in third though (she has a great floor routine). Guan Wenli, who placed sixth as a junior at the 2008 Pacific Rim Championships but then disappeared for much of 2008, is back, qualifying fifth into UB finals. The last thing that I’ll mention is that the overall scoring was pretty low at this event. Contrast most UB scores in the 15’s to He Kexin’s 17.325 at the nationals in May. This could mean either or both of two things: the girls are coming down from their peaks (which definitely seems to be evidenced by for instance Yang’s UB A score), or that in May the Chinese judges were artificially inflating scores. To be honest, I wouldn’t be surprised, and I think pretty much everyone at least suspects that national gymnastics federations artifically inflate their national competition scores right before a big international event. It makes sense. Anyway, it’s interesting.